I would definitely consider myself to be a “crafty” person. I love scrapbooking, crocheting and making handmade items for friends and family. One of the perks of being crafty are the cool tools. One of my favorites would have to be my Dynamo electronic label maker. Gone are the days of find the letter, turn the wheel and squeeze the handle. 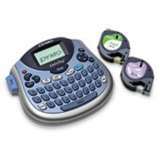 Anyhow, I use my label maker for many different purposes – labeling pictures on scrapbook pages, labeling albums and just labeling and organizing in general. However, I must admit that my labeling is not confined to my little projects. No, in fact, I pull out my figurative label maker many times for myself. I begin to make labels based on other people’s opinions of me, my current circumstances, moments of coming unglued and even my past. I can attach so many negative labels to myself that I lose sight of who and what I am. I have to remind myself that I am a treasured masterpiece of God. He created and loves me just as I am. The very same thing is true for you dear friend. God has created each one of us to be His masterpiece. Think about this for a moment, you wouldn’t begin to think of taking a labeler to an art gallery and pointing out things you didn’t like and attaching them to the painting. Then, why do we do that very same thing to ourselves or those fellow brothers and sisters in Christ? We have to trust the Creator and let His artwork – each one of us – shine out into the world without being hidden behind labels. I challenge each one of us to permanently keep the label maker in the drawer for craft projects. I would also encourage you to share something beautiful about yourself in the comment section. Thank God today for taking the time to make you into His masterpiece. Well said. Now if I will only remember that the next time I start to put a label on myself or someone else. I do little things to try to make days a little brighter for others. Jamy, you did it again! How powerfully your words speak to me ~ truly God-inspired! One good thing about me? I try to be open to God’s nudges, even when they scare me! wow I love the part where you said you would take a lable maker to an art musem and put lables on it that you didint like. I could just picture that. that was a beatiful life example. keep blogging I love your heart!